Today’s theme answers have been chlorinated with the addition of the chemical symbol CL. Wackiness ensues. Oh, by the way, I’m told this is a WSJ debut for our constructor, so congrats to Evan (though I believe he’s had other grids published elsewhere). 17a [Discouraging customer service slogan?] WE CLAIM TO PLEASE. Truth in advertising, eh? I like this one a lot. 27a [Sounds from a memorable trot?] SPECIAL CLOPS. Meh. It’s a little too far-fetched. Solid enough though not all that tricky for a late-in-the-week grid. I clocked in at 8 minutes, something, which is about as quick as I’ve ever done on a Thursday, I think. 5a [Subway fare]. HEROS. Got me with this one. I went with TOKEN at first. 26a [One in a long line of workers?]. ANT. Nice one. 50d [Avoid the line?]. AD LIB. Another good one. 19d [Tissue bather]. LYMPH. Yeah, I’m not discerning this one; I needed all the crossings. Anyone with insights into this clue? 33a [Baltimore, for one]. LORD. Hmm. Per Wikipedia, the Irish title of Lord Baltimore is extinct now, but there is a Lord Baltimore Hotel in Maryland. And of course, there’s the fictional Indian tracker from one of my favorite films of all time. A solid debut. 3.6 stars. This puzzle was NO trouble at all! 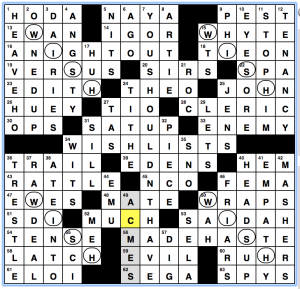 Ruth Bloomfield Margolin breaks the rules with today’s revealer at 35a/38a, NO / NO [With 38-Across, what a two-letter answer is in a crossword, usually … or a hint to 20-, 24-, 44- and 51-Across]. Those four theme answers are phrases that normally begin with “no,” but with the “no” removed and clued humorously. What are these phrases with no “no,” you ask? 20a, TWO WAYS ABOUT IT [Choice of routes?]. No two ways about it. 24a, SKIN OFF MY BACK [Result of some sunburn I had?]. No skin off my back. 44a, MAN IS AN ISLAND [Declaration concerning British geography?]. No man is an island. Really clever cluing angle on this one! Wish there hadn’t been a couple other “No man is an island” puzzles recently, though. 51a, LAUGHING MATTER [Nitrous oxide?]. Another clever clue! This one would’ve been even easier for me if I hadn’t put TACt instead of TACK at 16a [Approach to handling something]. It took me about 30 seconds to find that mistake and sort it out. 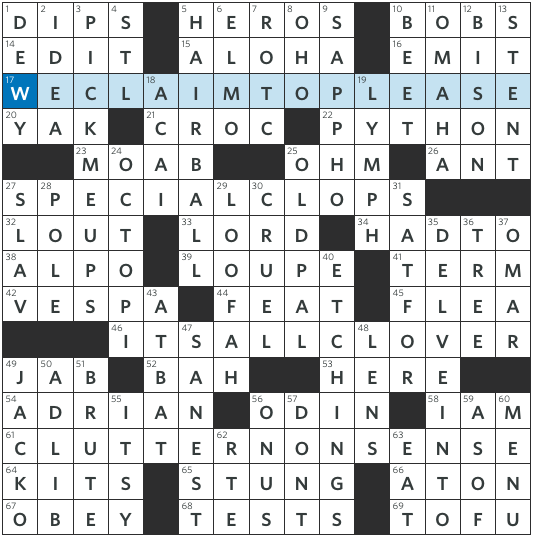 The theme itself is fine — well executed, Wednesdayish difficulty — but I thought the rule-breaking revealer was a very cool way to tie this one up in a bow. I would have liked the fill to be a little cleaner: ANCY in particular stood out to me, but there were a few other rough patches that might’ve been helped by taking the word count up to 74 or 76. Overall, though, there were some really nice things like SKI BIB and ON A WHIM [Because why not? ], “SO SOON?”, MYANMAR crossing YEMEN. A solid Thursday effort. Until next time! 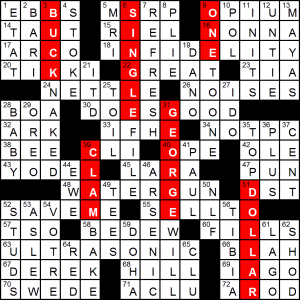 I’m fairly sure I’ve seen “synonyms for a dollar” as a puzzle theme, but this set has a cute revealer – TOPDOLLAR, and goes for quantity with five synonyms. BUCK, CLAM and GEORGE are for me more interesting than ONE and SINGLE because their regular meaning is far removed from the monetary one. I hope you didn’t get to the bottom too quickly and encounter [Too high for people to catch? ], ULTRASONIC which looks thematic as a long across with a “?” in the clue. Talk about a red herring! Not a fan of the trite [Distressed damsel’s cry], for SAVEME. A more specific clue would be the Queen song, but anything more neutral would have been appreciated. Surprisingly tricky for me was [Songwriter with John], PAUL, because TAUPIN had too many letters! Aw, it’s Christmas, even at BEQ’s puzzle today. This one isn’t as easy a theme to break down since there’s not really theme answers so much as a series of circled/shaded. We’ve got four diagonally placed sets of circles in the grid, each filled with the letters W-I-S-H. These are literal WISH LISTS, since they list diagonally down the grid. I slightly resent the cluing of this as “Aids for shoppers who are clueless at giving what people want … and a hint to this puzzle’s theme” — I’m a tricky person to buy for, and making a Wish List are an easy way to let my loved ones (who aren’t really clueless) figure out what to get me. In the grid: loved the cluing of “Was depressed, maybe?” for SAID AH. This entry was posted in Daily Puzzles and tagged Brendan Emmett Quigley, Evan Kalish, Frank Virzi, Ruth B. Margolin, Ruth Bloomfield Margolin. Bookmark the permalink. NYT: The appearances of RENO, ANOUK and ANON in the grid seem to lessen the impact of the NO “NO” revealer…. For me, “Anouk” was a great nostalgic flashback to my college time watching the movie “A Man and a Woman”. I agree with your take on the remaining two. Overall, I really liked this puzzle. 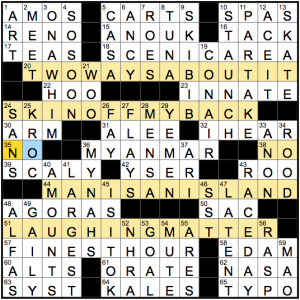 NYT: Not a fan of ROO crossing ROOD (which was a new one for me). Definitely on the easier side for a Thursday. WSJ – Evan Kalish anagrams to Avail Shenk. Is this a coincidence? Wow! Nice find. I didn’t bother to look because I know that he’s had some puzzles published in other venues. Unless Shenk is trolling us big-time! Wow, and here I thought my name just anagrammed to “naval sheik”! 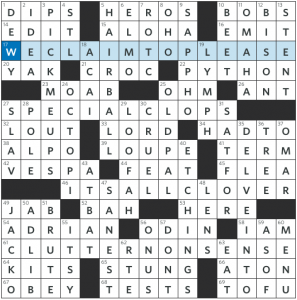 NYT: Loved this puzzle! Clever rule-breaking, clever theme answers, and clever/funny clues. A joy to solve! Jim, lymph is a bodily liquid that bathes the tissues in the body. Good BEQ today. Not entirely sure if part of Brendan’s intended gimmick was slanting the circled words because of the revealer’s second half. But assuming it was, that’s a neat trick. BEQ – I think you might be right (re revealer and circled letters). Great catch. That Other Puzzle Blog’s guest blogger made a provocative point today, and I wonder how Team Fiend feels about it. If you didn’t read it, he wrote that when grids contain sites of humanitarian crises like MYANMAR and YEMEN, it is the editor’s moral obligation to reference said crises in the clue. In his view, giving YEMEN a quirky clue about camel jumping, and mentioning the Rohyinga of MYANMAR without noting the genocide against them, is tantamount to whitewashing crimes against humanity. Of course, this flies in the face of the idea that puzzles should refrain from depressing subject matter whenever possible. I feel that asserting that Myanmar is the place where Rohingya are from threads the needle well enough. Calls attention to the issue without being strident. For Yemen a similar tack could be [Most impoverished Middle East Nation]. NYT. 38 down Cardinals crossing with a European river name got me. I thought Cardinals were STL. Never heard of ARI. Is YSER crosswordese? Yser is a river originating in France and flowing through Belgium to the sea. It was the site of a major battle in WWI, otherwise, yes, it is crosswordese. Yser is definitely crosswordese, but it’s a legit river in Europe that was the site of a WW I battle.